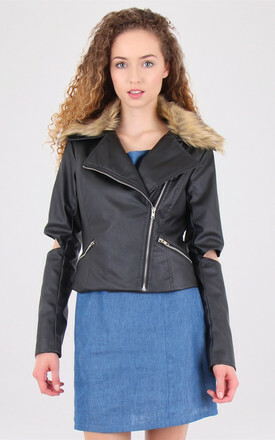 A Miss Truth classic, This faux leather biker jacket is an essential for complete an stylish and smart outfit, the cut out on the sleeve makes it different and a must have for this this season. Model wears size 8 UK. Complete your look with our range of Coats and Jackets. Whatever the weather, we have just the coat or jacket you need this season. Total Length: 45 cm/ 17.7"
Sleeves Length: 59 cm/ 23.2"